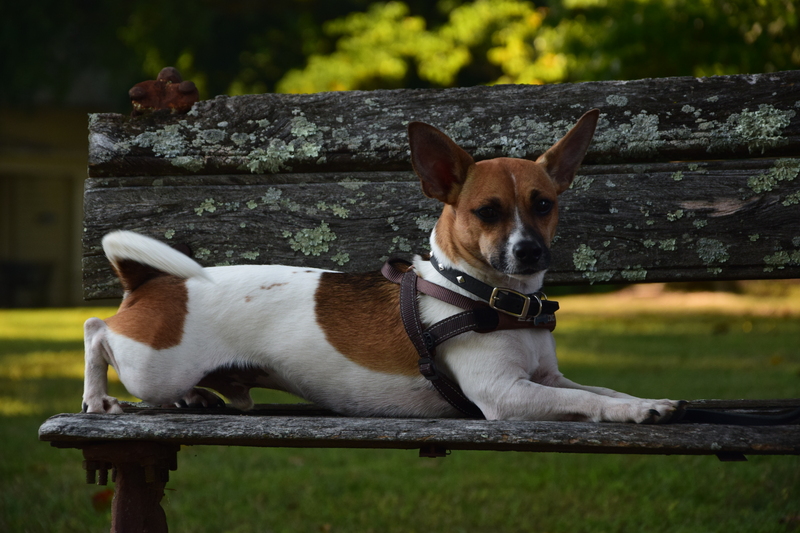 A blog about dogs & dog-human relationships. I’ve always loved camping. There is just something about sleeping outside, among the bugs, creeping nighttime creatures, and the occasional excitement (like that time a bear poked me when I was hammocking in Kentucky!). When I adopted Galley, I had a pretty good feeling she’d be a great camping dog. She spent her first months in the woods, so she is a happy girl when she’s able to just be outside. When I first took her camping, she loved it, and seemed to love that her person was inside this nice spacious (to her…it is a two person tent!) crate-like-spot. Pinot on the other hand, is a whiney little dude. Hence the name. Wine-y? Get it? He gets frustrated easily, and while he is pretty good off leash, I don’t trust him 100% yet, so there would be tethering (umbilical cord!) involved in any camping we do. As anyone who’s worked with dogs before knows, tethering/leashes/boundaries can create or enhance frustration and tension. Something that I have been focusing on with Pinot is relaxing. I’ve been approaching it almost like mindfulness. Instead of blindly reacting to things we find uncomfortable, why not make peace with it first and then analyze it to see if we can change it? I’ve found that dogs trained using shaping and capturing — thinking dogs — have an easier time with this, since they are already used to problem solving. Anyway, I’m writing this from my campsite. 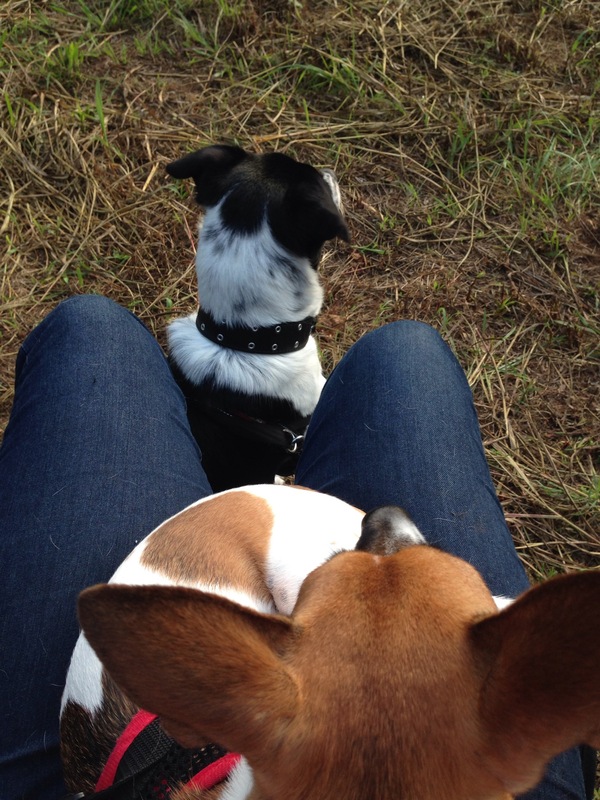 Both dogs are sitting calmly, one on my lap, one between my knees, looking out over a wide open field. We’ve seen a herd of deer…yes, we barked! And then we settled. I just realized I haven’t said a single word to them since we woke up. Haven’t needed to. Now, I’m sipping coffee as the sun warms us up, and frankly, there is not much that could be better than this. Well, today is the one year anniversary of Pinot. One year ago, a client texted me about a dog they had found…and of course she included a photo–how could I resist those ears?! Her neighbor was out walking her dog early in the morning, and when they got home, oops! They had a stowaway! Pinot had apparently joined up with them and followed them all the way home. She wasn’t interested in dealing with him, so she passed him on to her next door neighbors, long time clients of mine. I went to “see” him right away…and instantly loved his giant ears and big personality. Of course! I’d take him and see about finding his family or fostering/rehoming him. 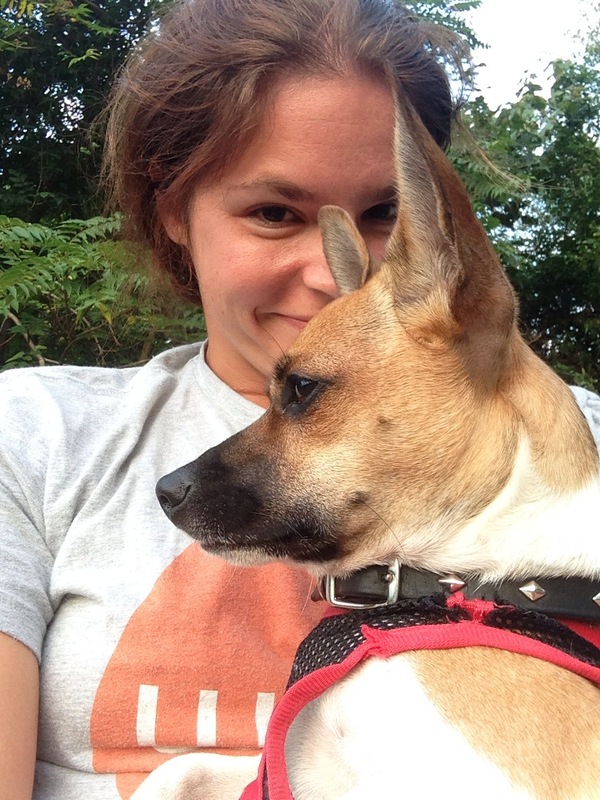 Surely, this lovable, adorable, chunk of a terrier mix had a family. His ultra long toenails and intact male parts suggested otherwise, but I was determined. I plastered his face at vet’s offices, pet stores, street corners, and got nothing. So, a month went by. A month in which I realized Pinot had zero house skills. He could not settle at all and went everywhere at top speed, mouthing and parkour-ing off of anything and anyone in his way. He humped my other dog compulsively (luckily she didn’t mind). I mean, non stop. If she moved, he mounted her. The only time he stopped zooming was to hump her. Or to make his mark. Everywhere. I felt like a failure when I broke down and bought belly bands and maxi pads. FOR A DOG. Shouldn’t I be a better trainer than that? I shouldn’t need those. Hm. When it became clear that he did not have a family, I excitedly decided to get him neutered, which, lucky for me, did help the marking a LOT. It doesn’t always, especially with a dog of unknown age. Who knows how long he’d been practicing marking?? I got him into playing ball. Which channeled his energies enough to curb his drive to hump. I got him on the prey model raw diet, which satisfied his appetite, and I believe, helped with housetraining AND overall behavior. This little guy does not need any sugar rushes in his life. Raw fed dogs generally drink less water, due to the water content in their food…and since he wasn’t chugging water to compensate for kibble, his tiny-dog bladder wasn’t constantly needing to be emptied. He learned about chewing on toys, kongs, puzzle toys, dog beds, and with some strategic tethering, he learned that he could in fact relax. It was possible. Over the course of this year, he has gone from being crated (or on leash/tether) 100% of the time when not outside, to having full run of the house 100% of the time. Turns out, he came with a brilliant recall, and it has only gotten better. He still jumps on people and loves people just a little too much…but is that such a problem? Maybe for some, but I guess I had other priorities. He goes kayaking with me. He sleeps in the crook of my elbow. Yes, under the covers. He and Galley love each other ridiculously. He is one lucky little dude.